Through the centuries, marble has been used all across the globe to create unique and beautiful structures and works of art. Consider the Taj Majal in India; the Parthenon in Greece or the Statue of David by Michelangelo. Marble is a metamorphic rock, formed when limestone is exposed to extreme heat and pressure. 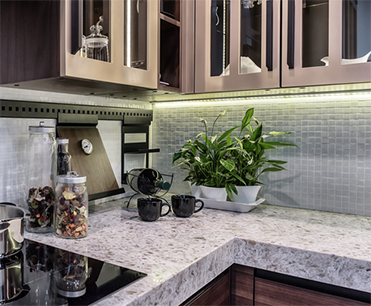 Marble comes in white, as well as shades of grey, pink, yellow, green and more. The colors appear as swirls and veins in the base white or gray. This is due to various minerals in the limestone before it underwent the metamorphic process. You can bring the classic beauty of marble into your home with marble countertops and vanity countertops for your kitchen and bath. Marble countertops are heat resistant, but not indestructible, so don’t put a pot straight from the stove on the counter. The same goes for granite and quartz. Like granite, marble is porous, so it will need to be sealed to avoid staining from wine, oils, etc. Marble is softer than granite and quartz, making it more prone to scratches,stains and chips. But with care, marble countertops can withstand the test of time while still looking beautiful. Marble is also great for fireplace surrounds, mantles, marble tile and more. Here at Advanced Stoneworks, we have the largest supply of marble slabs for you to choose from, in various shades and sizes. We invite you to stop by our showroom to see what we have to offer. Or call 251-408-7818 to schedule a free estimate. Serving all areas within a 2 hour drive from Mobile Alabama.